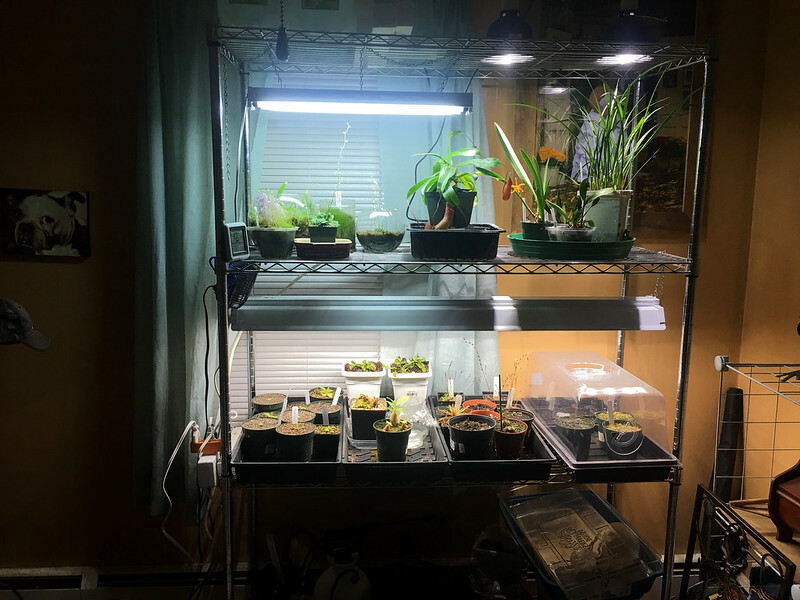 My indoor setup is basically one four foot t5ho fixture and a tiny Nepenthes terrarium below. 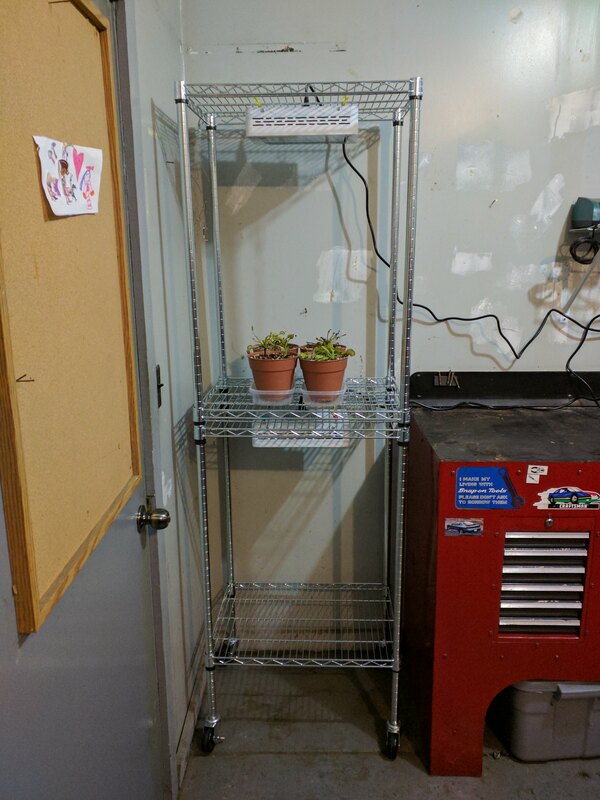 I recently got some new pots to help use space more effectively. 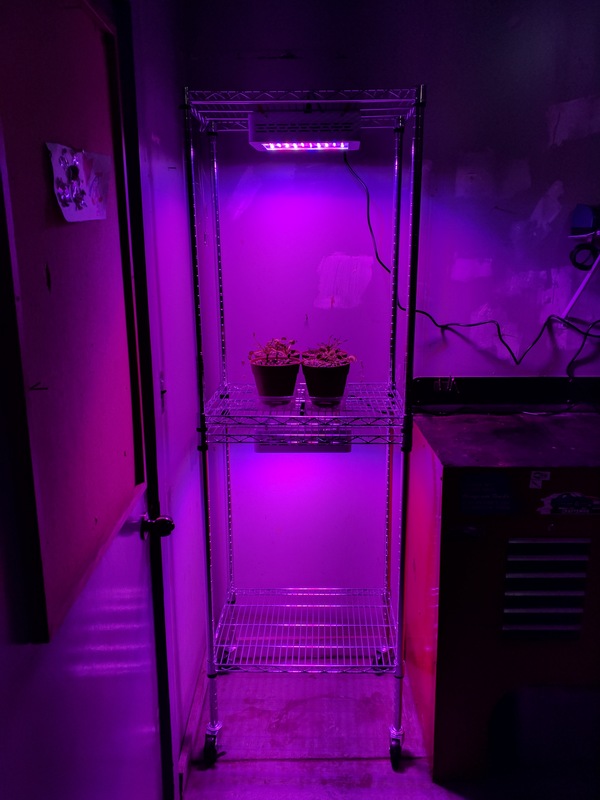 I'm still getting used to the lights, in terms of how far they should be above the plants, whether I should take extra measures to prevent overheating, etc. Most of my plants seem to like it. Surprisingly, my average humidity is only around 30 or 40%! Even my South American sundews do well... I think! As for my Nepenthes terrarium, it's quite small, only housing my Nepenthes maxima "Watutau Dwarf" and my Nepenthes murudensis. I try to keep light levels lower and humidity higher than in my main setup. That's it for me! What about you? Wow, that's a lot more impressive than my setup! Are you planning on turning that graomogolensis tank into a general South American sundews tank? How far do you keep the flourescent lights above your plants? mo_carnivore wrote: Wow, that's a lot more impressive than my setup! Are you planning on turning that graomogolensis tank into a general South American sundews tank? How far do you keep the flourescent lights above your plants? Once I get the nerve to do some leaf cuttings on the grao I want to fill it up with those and possibly add a few more SA species. I’ll have to get a bigger LED though. I’d say the lights are anywhere from 6-9 inches depending on pot size. Just T8 shop lights with 6500k bulbs. I actually wouldn’t mind adding one of those D. latifolia you have. My dormancy setup. My plants are strictly outdoor plants except for winter, they would freeze solid for 3 months if i left them out there. That’s a great setup. Plenty of room to expand. 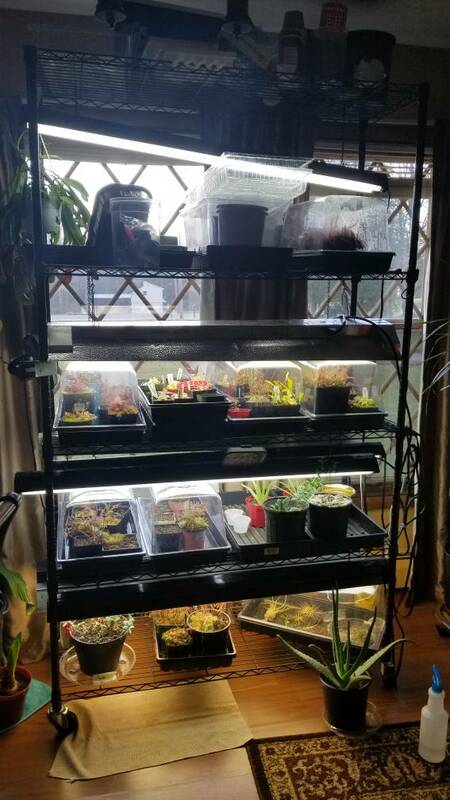 I like seeing the variety of peoples setups, as of now we have 10x20 quad thickness watering trays with various plants in them ...on the covered porch that is elevated with full south/southeast/east sunlight blasting it all day nothing fancy indoors at all but I want to get a small tank going for growing our live sphag as I don't know how great my results are yet outdoors we will see! Here's a shot if mine. Nothing special. Needs more work but it's a step up from what I had. Ignor the bottom shelf needs cleaning. I plan on putting a few grow out tanks down there and a propagation tank. Just started raising the plants. Have 2 sundews, 3 flytraps, 2 pitcher plants and 2 bladderworts. The new plants not shown. My setup, just started in the hobby. Heres mine! I love the mondi domes for humidity control! Here's my Highland/intermediate/lowland enclosure right after upgrading the cooling system and adding a heliamphora nursery - that's the glowing spot under the fogger pond. This pic is about a year old. My grow self, which just doubled I size but I don't have a picture of the larger shelf yet. Thanks for looking, happy growing! Oh my goodness wow @ Nepenthes0260 and iamjacksplants, those heliamphora are amazing!!! I'll try to post some pics of my set ups tomorrow when I have a bit more time.